Seoul crossed out a reference to nuclear-armed North Korea as its enemy in a defence white paper published Tuesday, amid rapidly warming ties despite stalled nuclear talks between Pyongyang and Washington. 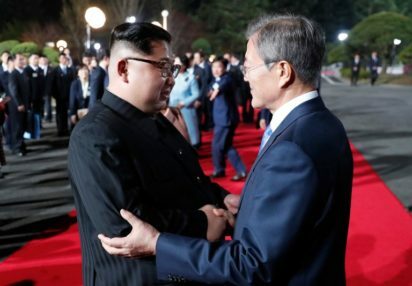 But ties between the two Koreas have warmed significantly in recent months under the South’s dovish President Moon Jae-in, who has held three summits with North Korean leader Kim Jong Un since taking office in May 2017. The biennial report — a blueprint for South Korea’s defence and security goals for the next two years — said “any external force” that threatened the country’s sovereignty or territory would be considered an enemy. It also described Pyongyang’s weapons of mass destruction as a threat but did not apply the term to its military provocations or cyber attacks. In the previous white paper, dated 2016, Seoul described Pyongyang as posing “major threats” to national security, adding that “the North Korean regime and its military will remain an enemy” as long as such threats persist. Moon has pursued a policy of engagement with the North, in increasing contrast to Washington, which insists pressure should be maintained on Pyongyang until it denuclearises. The 2018 white paper said that the three inter-Korean summits as well as Kim’s Singapore meeting with Trump had created “a new security environment for the complete denuclearisation of and peace on the Korean peninsula”.